Futurebud International ( hereinafter called the "Company" ) believes it is our social responsibility to comply with laws and social norms, as well as at the core of our our Corporate Code of Conduct, to commit ourselves in carrying business activities compliant to the law as well as socially fair manners, to enhance a solid sound growth of the Company. Especially, regarding corruptions, no matter whether at home or abroad, all the executives and employees of the Company are strictly prohibited to give, offer or commit illegal entertaiments, gifts, conveniences or any kinds of econimic advantages whatsoever to government officials or equivalent. Further, when demanded for such illegal economic advantages by them, all the executives and employees of the Company are firmly determined to refuse it. In order to internally promote and raise consciousness of compliance, employees are requested to pledge to be fully aware of their social responsibility, observe corporate ethics in a highest manner and continue to act with integrity. We shall constantly review and improve our Code of Conduct. To respect human rights, and refrain from discriminating on any basis and engaging in any form of harrasment. To promote fair business practices and comply with trade rules and regulations, and request our business partners as well as their affiliated companies to do the same. To comply with international treaties, laws and regulations concerning the environment, trade and anti-corruption. The Anti-Bribery Clause and our audit rights per our contract shall apply not only to our direct business partners but also to their affiliated companies as well.We shall decline to do business with those not accepting this in writing. Prior to starting business with a new client, the potential client shall be examined for appropriateness based on information from the Internet, various sources engaged in the similar business, reports of credit reserch companis as well as from external experts, and then approval on starting business shall be obtained from the President or CSR Unit. Manager. To resolutely reject to do business with any party which has or may have a connection with any organization, group or indivisual engaged in unlawful activities, and refuse providing fund or convenience with such unsocial parties. To maintain proper legal and ethical standards with regard to gifts and entertainment. 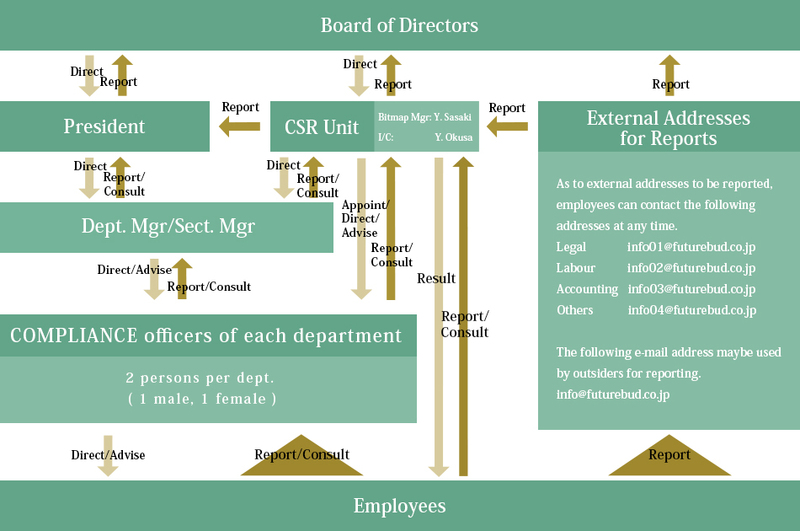 To protect and properly use confidential information of the Company and others, protect the intellectual property rights of others, provide financial and accounting records and reports in a timely and accurate manner, furthermore, refain from doing anything against the interest of the society and the Company. Should any conduct of the Company's employee which may interfere with this Code be found, it shall be reported to and consulted with anyone of the Compliance Officers ( hereinafter called CO ) mentioned below, then remedial actions shall be taken by the President promptly.